A callisthenic workout routine is an exercise routine that uses your body weight as resistance instead of an expensive gym membership or exercise equipment. All you really need is enough space to do the exercises. This article will focus on instructions of several popular calisthenics workout routines. Calisthenics workout routine offers an inexpensive way to design your exercises to accomplish your personal health goals. Because no equipment is necessary, you can do most of these exercises anywhere. If you want to lose weight, you can do that with a well-designed routine. If you want to tone or build muscle, this is also possible. 1. To do a pushup, lie on the floor on your stomach. 2. Put your hands palm-down on the floor directly under your shoulders. 3. Straighten your arms pushing your body off the floor. 4. Bend your arms to lower your body back to the floor. 5. If pushups cause pain in your back, do this on your knees instead of your toes. 1. With your knees bent and feet flat on the floor, lie on your back with your hands locked behind your head. 2. Using your abdominal muscles only, raise your upper body off the floor. 3. Hold that position for a few seconds then slowly lower your upper body to the floor. 1. Stand straight with your feet under your shoulders and your hands down to your sides or on your hips. 2. Without losing your balance, take a step forward with one of your legs. 3. Bend your legs and lower your other knee as close to the floor as possible. 4. Straighten your legs to return to your original position. 5. Repeat with your other leg. 1. With your hands behind your head and your feet directly under your shoulders, push your hips back and bend your knees down. 2. Be sure to keep your back straight so your feet are always under your shoulders. When you bend your knees, the final position should have your thighs parallel to the ground. 3. Hold the position for a second and repeat. 4. If you have knee problems, be sure to check with your healthcare provider before doing this exercise. 1. Hang from the bar and grasp the bar either overhanded or underhanded. 2. Bending your elbows, pull yourself up until your chin is at the level of the bar. 3. Straighten your arms to the original position and repeat. 1. Lie on your belly on the floor with your arms stretched in front of you. 2. Keeping your legs and arms straight, raise your head and chest off the floor. 3. Hold the position and repeat. 4. 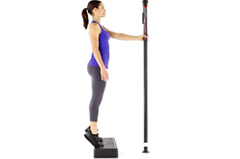 Make this exercise more challenging by raising your feet and chest off the floor. 1. Stand on the edge of the step with your toes on the step and your heels hanging off the step. 2. Raise up on your toes and then slowly lower your heels back below your toes. 3. Repeat this exercise several times. 1. Start with your feet together and hands at your side. 2. Jump and spread your feet wide; at the same time, raise your arms over your head and touch your hands together. 3. Jumping again, return to the starting position. A rubber ball works best for this exercise, but you can also use a balled up washcloth. 1. 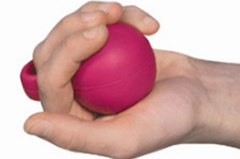 Squeeze and hold a rubber ball or a balled up washcloth for at least a minute. 2. After squeezing, stretch your fingers as wide as possible and hold it for 30 seconds. 3. Repeat with your other hand. Before starting any calisthenics workout routine, be sure you clear the exercise with your healthcare provider. Then, before each routine, start with a stretching routine that warms up your muscles. Doing this faithfully will help prevent sprains and strains that can happen to "cold" muscles. Studies show that a concentrated 30 to 60 minutes of exercise each day can burn fat. Be sure to do exercises that will target each area of your body. Do not necessarily have to do all of the exercises each day. Remember that it is the quality more than the quantity that produces the best results. End each calisthenic routine with gentle stretching which will help your muscles cool down. Try a few minutes of yoga or meditation after your exercise routine.